Armando Iannucci (of In the Loop and Veep fame) has become the modern master of the politic satire (usually aimed at current events), but here is a historical period-piece. What’s his end-game? A correlation to Putin’s Russia? Trump’s America? Any cult of personality that innately leads to gas-lighting the public and internal chaos? Is this a cautionary tale? There’s a lot of great stuff here. Early on, an accomplished pianist (Olga Kurylenko) who has a personal vendetta against Stalin is called out by a radio producer for an “unauthorized act of narcissism” – a hilarious charge while living under the regime of a complete narcissist. Also present is Iannucci’s trademark depictions of the absurdities of protocol (and, on the flip side, the chaos in the complete lack thereof). There’s a running gag of various Committee leaders spouting off viciously at errand-folk and servants who need approval on every bit of minutia, only to “so sorry” them in a very British manner moments later. The whole cast is British (hey, look, it’s Monty Python alum Michael Palin, everyone!) and wisely nobody attempts a bad Russian accent. It’s all very…funny. The costumes, set design, music, editing, etc…are all polished and top-notch. It’s all so well done. Which makes the serious bits…and the warning (oh, how I hope we all live to look back on today and laugh the same way)…all that more terrifying. 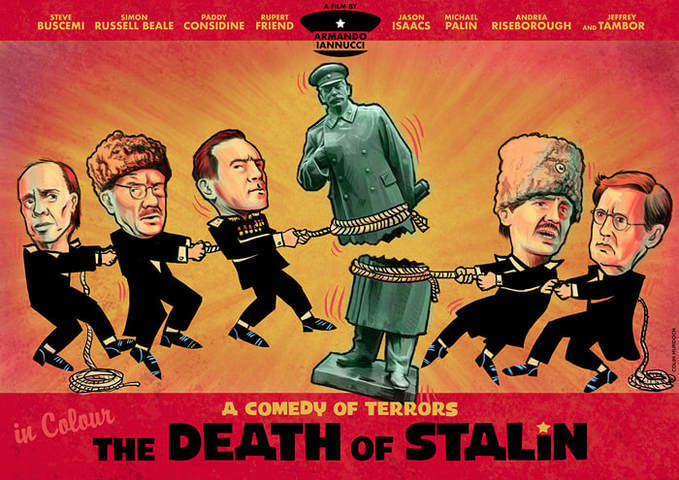 Billed as a “Comedy of Terrors”…The Death of Stalin is spot-on. Like Greek Comedy (as in not that different from Greek Tragedy) level spot-on. That’s not very funny…is it? This entry was posted in Art-house Cinema, History, Movie Reviews, Movies, Politics and tagged Armando Iannucci, Cautionary Tale, Comedy, Comedy of Errors, Comedy of Terrors, Cult of Personality, Georgy Malekov, Historical Period-Piece, Jeffrey Tambor, Joseph Stalin, Michael Palin, Nikita Khrushchev, Olga Kurylenko, Political Satire, Russia, Steve Buscemi, The Death of Stalin.